Pinson's Farm Yields Record: The Paul Pitson farm in Evans Valley was the scene of a great discovery last week, on August 20 and 21. When bones of seven prehistoric animals were unearthed by a gas shovel which was being used in excavating an irrigation pond in a cat-tail swamp. Mr. and Mrs. Pitson purchased the farm from I.R. McKibbins last winter and moved there in February, planning to devote their time growing Easter lilies and daffodils. It was while they were excavating a hole 20 by 40 feet to be used as a reservoir for the irrigation system to be installed that the bones were uncovered on Tuesday and Wednesday. Parts of two tusks were found, one 71/2 feet long and 7 1/2 inches in diameter, and one 3 feet long and 9 1/2 inches in diameter. It is estimated that the original tusks must have been from 16 to 20 feet long. Many of the bones were found at a depth of only three or four feet. All the bones uncovered last week, including leg bones, shoulder blades and other parts of the skeletons of huge mammals, which roamed the valley from 500,000 to a million years ago, were found within a small area of one acre. Bones of prehistoric animals have been found in various parts of the world in recent years, but seldom have so many been found in one place as was the case here last week. Bones were first found on the farm in 1905, when the late Bernt Storlie owned the land. He and his son Henry were digging an 8-foot well in the swamp when they found rib bones, legs and teeth of the huge animals at a depth of about three feet. They rarely mentioned their discovery, and didn't look for any more bones. Two years later, in 1907, J.D. 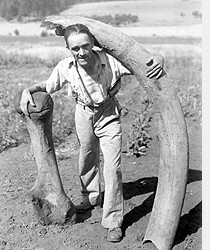 Drake, local photographer, found a large slab of ivory tusk a quarter of a mile west of the Storlie well, and showed it to him. At that time Mr. Storlie also showed the bones he had found to Mr. Drake, but didn't want his farm land disturbed. Two paleontologists from Portland, Leo Simon and H. "Pat" Holland, were here last weekend and lectured to the people who had assembled at the swamp on Sunday to view the sights. Cars from New York, Indiana, California and Washington were seen, as well as many from Salem, Woodburn and other nearby communities, when the bones were on display for the first time last Sunday. June Drake Photo courtesy the Silverton Country Historical Society.